Following positive news regarding the massive success of Angry Birds Space, Rovio announced today that it has acquired Futuremark Games Studio. FSG is the gaming division of well-known benchmark software developer, Futuremark, and is probably best known for its Unstoppable Gorg and Shattered Horizon titles. The CEO of Futuremark, Jukka Mäkinen, says the company will now focus on supporting industry and gamers, alluding to the benefits of jettisoning its gaming division. Mäkinen says Futuremark is currently working on a multi-platform version of 3DMark which offer comparable benchmarks across many systems and form factors. Angry Birds in Space was downloaded 10 million times within just three days following its release. Also, Rovio recently shared that players collectively log a total of 5 millions hours a day playing Angry Birds -- just imagine what we could accomplish if people weren't playing Angry Birds all day long. Being that Rovio and Futuremark are two privately held companies, details of the transaction aren't necessarily required to be publicized. Neither Futuremark or Rovio have disclosed the transactional value or fine print of the deal. This is Rovio's second acquisition thus far. The game developer bought out Kombo Animation Studio last summer. Both acquisitions appear to be Rovio fishing for talent. 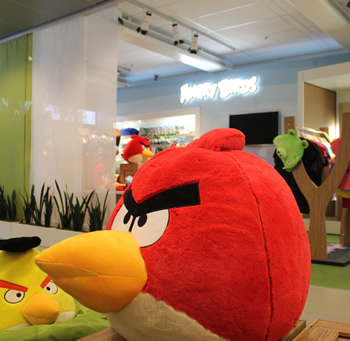 There have also been talks of an upcoming IPO for Rovio, however it appears a public offering is off the table for now. Currently, Rovio is thought to be worth about $1.2 billion. Unsurprisingly, that's up from valuations of $900 million in 2010.